Could you please tell me regarding drill through functionality available on flex grid ? I have a scenario to mimic same functionality to show on popup and make the changes to edit some times and save them. If you need to build your own drill through like pop up the possible solution is to disable Flexmonster drill through pop-up and then on double click event (https://www.flexmonster.com/api/celldoubleclick/) run getSelectedCell() (https://www.flexmonster.com/api/getselectedcell/) API call. With that information, you can select the necessary data from the storage to build your own pop-up. In case you prefer to use editing feature in Flexmonster pop-up please enable the feature when setting Flexmonster options (https://www.flexmonster.com/api/options-object/). 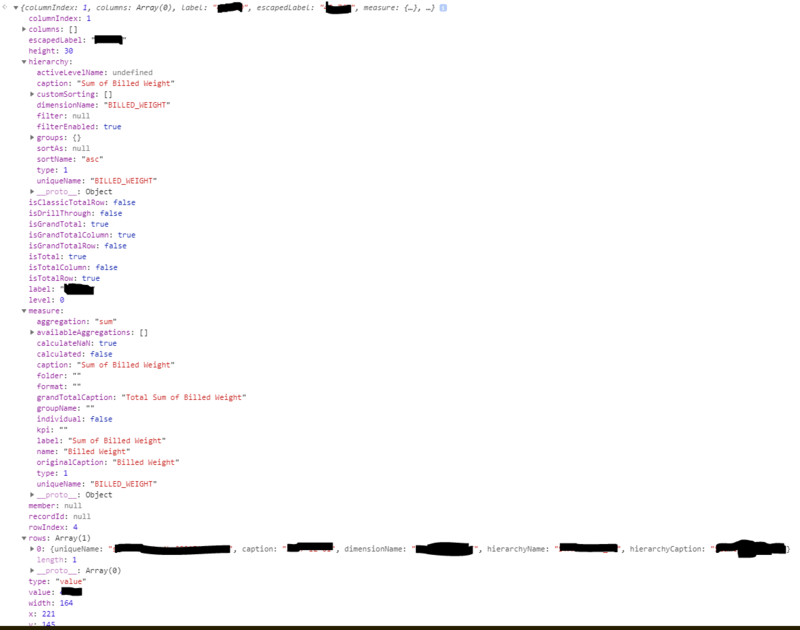 After that, you can use the datachanged event: https://www.flexmonster.com/api/datachanged/ which is triggered when the cell was changed. Such an approach will allow you to define that the editing was performed and after that, you can save the changes. method to pull the details related to current row. But only that cell information I am able to retrieve which is selected and the parent column details only are displayed. Please have a look on below attached screenshot. I have two columns available. But only 1 column which is parent one, details I am able to view. But I am expecting the same functionality as drill through has. I have business requirement to pull all the details related to selected cell and complete row. I have found the below property with Cell Data Object. But not able to use it. rowData – Array of Cell Data Objects. The property is defined when the cell is double-clicked in the drill-through view. Contains the array of cells from the underlying data row. Only for CSV, JSON and OCSV data source. Could you please help me to achieve this drill through functionality as per my requirement ? Thank you for the detailed explanation. We have looked through your requirements and found that right now, the existing functionality of Flexmonster does not allow to support them. The "rawData" property is only applicable to the drill through view. Right now, the only possible solution we can recommend you is a customization project. Please contact your Client Service Manager to discuss the terms. Thanks for the response. I have sent email to CSM. But I have not received any response yet. I will follow up to get possible solution of this requirement.